The word colossal can only begin to describe the following arsenal of new music gracing the scene, this time around in the form of JOOF Editions Vol. 5. 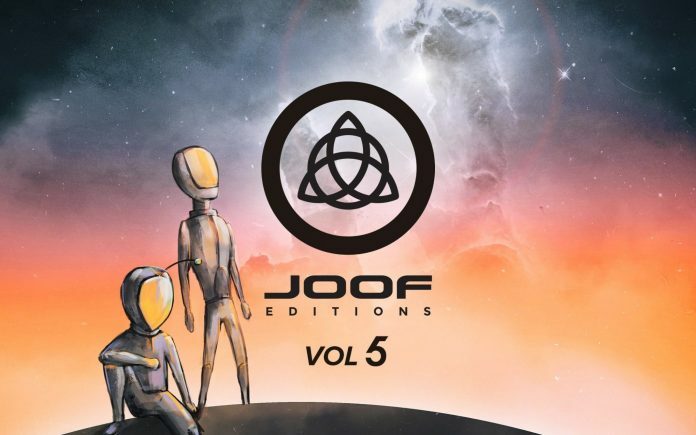 Mixed by the stellar team of John 00 Fleming (JOOF), Gai Barone, Paul Thomas, and Tim Penner, the cutting-edge JOOF soundtrack is a master-work of some of the most talented artists in the game. Manifesting their newest musical visions and stylistic productions into a cohesive ballad of freshly minted tracks, everything here stretches far into realms of deep electronic, trance, progressive, and beyond. To put this major piece of work into perspective, each of the producers had up to two hours to fill the edition with their current state of progressive choosings. From the get-go, Vol.5 jumpstarts a mind-bending journey of its own, taking listeners into another volume of genre-pulsators in all their glory. Supplying his well-recognized lineup of avant-garde tones, Tim Penner reigned in this marvelous description by John. Packing in plenty of his own tuneage, alongside tracks by Raisell, Michael A, The Stupid Experts, ACUMEN, and more, Tim Penner nailed his section. John’s delightful words towards Gai in the below are a pure representation of the landslide of wondrous music Gai brought to the table for this mix. From artists like Dead Panther, to Ayer Astura, to Charlotte Petitte, to Mark Found and many others, Gai’s contribution boasts a natural ebb & flow that courses through your veins in quite the one-of-a-kind way. With Paul Thomas on the tracks, things are sure to heat up and they absolutely did for Vol. 5. Thomas’ repertoire for Vol. 5 is chock full of adventurous sounds that listeners can vibe out to for as long as their heart desires. Aly & Fila vs Ferry Corsten, Dmitry Molosh, Sam Heyman, Bluum, and Andretta stand alongside numerous others that finalize Thomas’ collective, arguably creating the most sensory-inviting mixes of the entire album. Completing the edition is of course, John 00 Fleming who stocks up the album with a fiery mix of all sonic desires. On a quest to source the world with grandiose elements of songs across the spectrum, John’s mix hits everything from groovy beats, to house-centered records, to cryptic undertones, and many more surprises in-between, John’s newest edition is a wild success in our eyes. By the end of this surplus of hours of music, it’s checked all the boxes of soaring through valleys of clouds, entering the depths of dark soundscapes, being lifted into exquisitely powerful instrumentals…the journey goes on. To top off all the thrills, mark your calendars as Hernan Cattaneo, John Fleming, and Paul Thomas are giving a cheers to this incredible body of work on April 21st, and in no better place than The Arch in Brighton (John’s hometown). Sure to be a wonderfully special celebration for all those in attendance, JOOF Editions Vol. 5 is a undoubtedly going to last the ages.